We lost Katy two weekends ago. That sort of sounds like she wandered off to play with second graders on the playground at the local Catholic school, again. Or ran over to the middle school to beg (and receive) meat from the cafeteria ladies, yet again. We used to “lose” her quite a bit when she was younger. 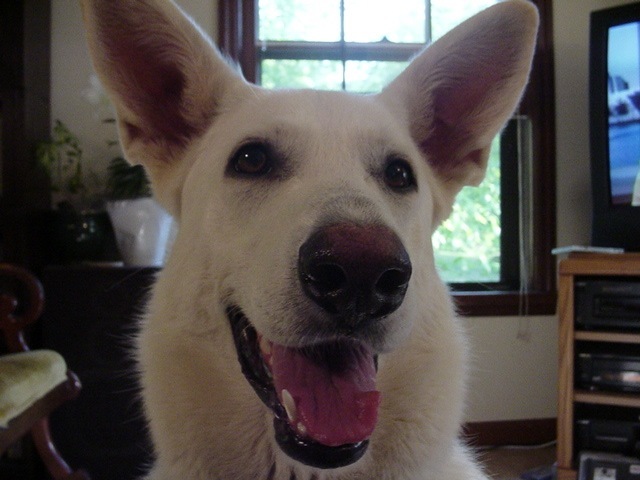 I’d get a call, “Do you have a large white German Shepherd?” and sure ’nuff, she’d be gone. So it’s really hard to accept that she’s not just out on a walkabout, or sleeping in the next room. She loved to howl, and since we live only two blocks from the firehouse, she howled at fire trucks. In fact, she could not only set up quite a ruckus herself, she eventually taught our other dog and all the dogs in the neighborhood to join in. She was full of life. The vet techs called her the white tornado behind my back. She would fly through a room, tongue hanging out, flinging a fog of white fur into the air, running up to people who were sure she was going to eat them. At 112 lbs, she looked a little scary. And unfortunately her favorite people seemed to be little kids, cats, and people who are afraid of dogs. She loved to go to the vet because at any given time, there’s likely to be all three of those in the same waiting room. The fact that the receptionist spoiled her with treats so badly that Katy knew which drawer the treats were in and would go straight to that drawer first thing upon arrival, was just a bonus. She loved to howl, and since we live only two blocks from the firehouse, she howled at fire trucks. In fact, she could not only set up quite a ruckus herself, she eventually taught our other dog and all the dogs in the neighborhood to join in. She was full of life. The vet techs called her the white tornado behind my back. She would fly through a room, tongue hanging out, flinging a fog of white fur into the air, running up to people who were sure she was going to eat them. At 112 lbs, she looked a little scary. And unfortunately her favorite people seemed to be little kids, cats, and people who are afraid of dogs. She loved to go to the vet, because at any given time, there’s likely to be all three of those in the same waiting room. The fact that the receptionist spoiled her with treats so badly that Katy knew which drawer the treats were in and would go straight to that drawer first thing upon arrival, was just a bonus. She’s probably the most beautiful dog I’ve ever owned or ever will. 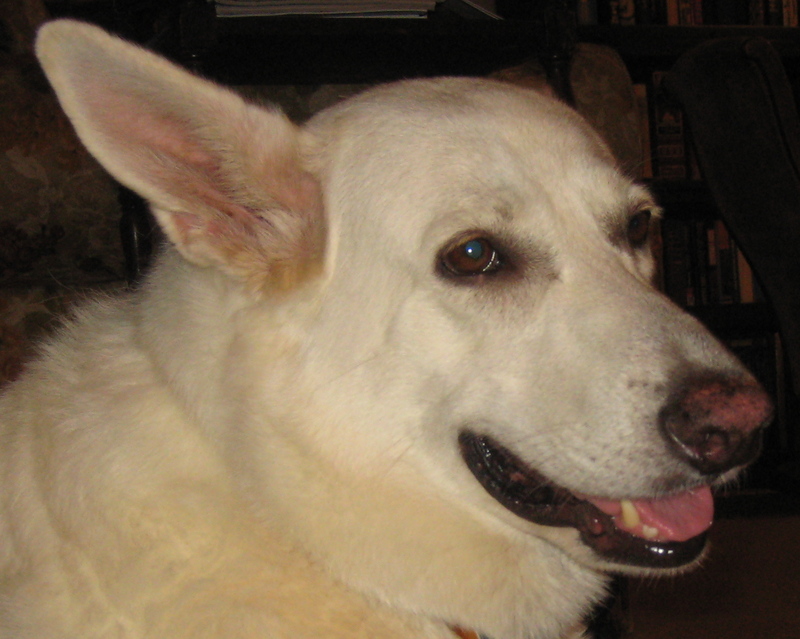 Except for being bigger than she should be, she was a perfectly formed German Shepherd, and solid white. Well, except for a vague golden stripe along her back (where Shepherds are usually black) that you could see in certain light. Everywhere we went someone would notice her and comment on her. Most were surprised to find out that yes, she was full-blooded German Shepherd, and a few just refused to believe me. She was a very unique sight. I especially loved those giant brown eyes with perfect little white eyelashes. Like Andy (our first Shepherd, whom we loved and who lived to be 13) her ears were that plush velvet soft that you can hardly even feel when you touch them and baby pink on the inside, obviously. I would walk by her and just run my hand along her ear. Her nose was also bright pink most of her life, but had started to freckle with brown spots in her old age. I can’t believe you put furniture over my favorite vent! She loved air conditioning, and would stake out the vents in the summer. When she was just a puppy, she’d lie on top of one and cool her whole belly. 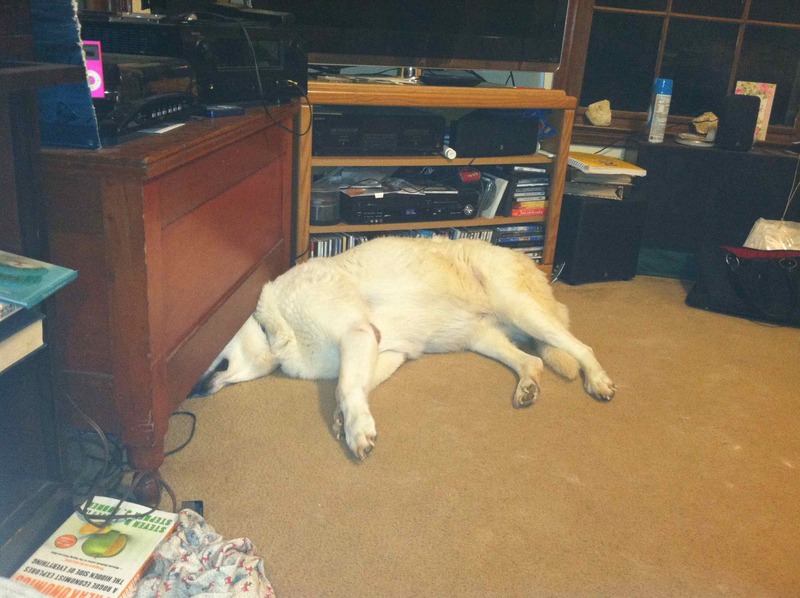 Of course when she grew up to be German Shepherd size, she could just barely fit her face on a vent. And she’d finally learned that if one vent quite blowing that lovely cooling breeze, none of the others would be either. When she was just a puppy, she would have to check every vent in the house when the AC cut off. But if the AC was on, she was on a vent. One of the last photos I took of her was of her trying to stick her head under a blanket chest to reach one of her vents I’d so rudely covered with a piece of completely useless furniture! More than a few times she would have to be rescued from a vent cover because while she was lying on it, her tags would fall down between the louvers. I guess it’s lucky that the cover was loose, so she could pull the thing out of the floor and go get a human to unhook it from her collar, rather than being trapped right there. Or maybe it wasn’t loose until the first time Katy got stuck in it . . . 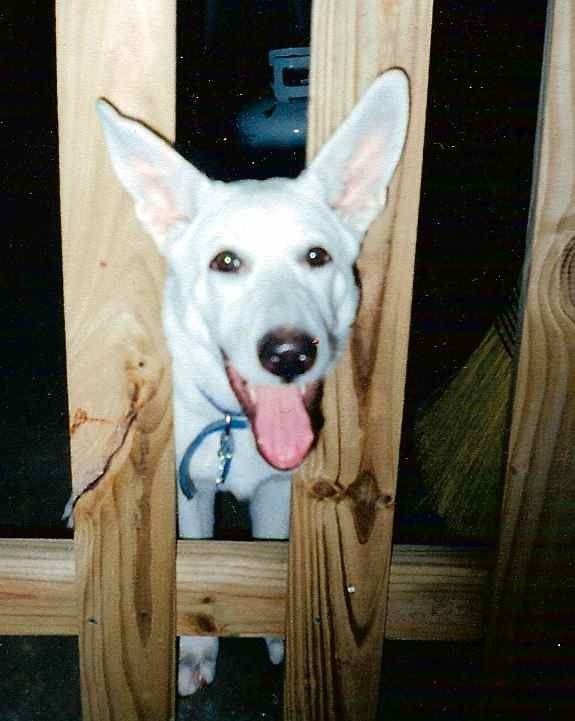 Yes, she finally grew into those ears, and couldn’t stick through the fence, anymore. Anyway, we miss her. We will miss her. Next Post What am I up to today? I enjoyed your tales about Katy. She was one very lucky and happy girl and I know you will always miss her. Loved your Katy memoir. I remember you telling me about her getting out and going to the cafeteria at the school. She was adventurous, and you took that in stride. Sherron, you have a knack for writing. You’re a good story-teller. Sherron love…never say you can’t write… I now know Katy and you have given me that gift. There are those of us who are just dog people, kindred spirits, without the fur and the cold nose. Wannabes, who can never hope to match the unadulterated love that shines from those deep brown eyes surrounded by little white lashes…or the endless joy that the wide swinging tail indicates. Thank you for sharing Katy with us. You have to know that she is up in the heavenly cafeteria right now…mooching meat from the angelic lunch ladies. Thank you everyone for your encouraging words.